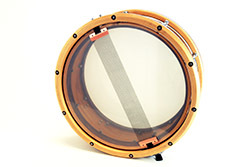 The purpose of the snare beds, very slight depressions in the bearing edge at either side of the bottom of the drum, is to allow the snare wires to lie evenly against the resonant head. Without these beds, tension on the ends of the snare wire will actually pull the wires away from the head in the middle of the drum. Snare beds create a slight curve to the surface of the head, letting the snare wires lie against it without an excess of tension on them. Besides the selection of snares and the tension on them, the width and depth of snare beds are the variable factors in the extent to which the snare sound is heard in the overall sound of the drum. The snare beds, in other words, are closely related to the sensitivity and response of the snares. Carolina Drumworks snare beds -- whether for kit snare wires or concert cable/wire configurations -- are cut to specifically designed depths, widths, and shapes, to allow the snares to vibrate against the head without having to be overly tightened and, ultimately, choked. The snares lie gently and evenly against the head for better response, giving the player just the right amount of snare sound throughout the dynamic range of the drum.